In 2003, Jonathan T.M. Reckford ’84 had been a successful business executive at some of the nation’s major corporations when he felt a calling to serve others in a deeper way. He left the corporate world to become a pastor and now leads the world’s foremost global nonprofit housing organization. He’ll share his story and advice as UNC’s Commencement speaker on May 12 in Kenan Stadium. Reckford has deep ties to Carolina. His father, Kenneth Reckford, was a longtime faculty member in the classics department who, in 1990, established the Mary Stevens Reckford Memorial Lecture in European Studies to honor his wife. One of Jonathan Reckford’s children is a Carolina graduate, and another will attend UNC this fall. Reckford was a Morehead Scholar at Carolina, where he earned a Luce Scholarship that took him to South Korea. There, he worked in marketing for the Seoul Olympic Organizing Committee and coached the Korean rowing team for the 1988 Olympics. Later, Reckford worked in executive and management positions at Goldman Sachs, Marriott, The Walt Disney Co. and Best Buy. 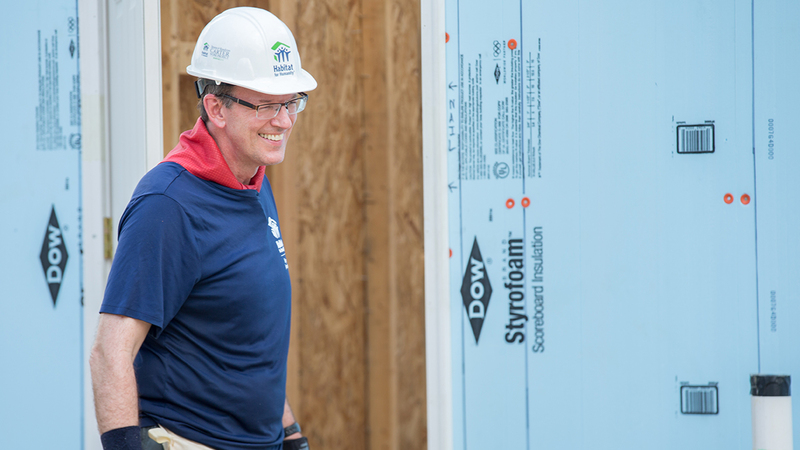 He spent two years as an executive pastor of a 4,300-member church in Edina, Minn., and became the CEO of Habitat for Humanity in 2005. Habitat has helped more than 22 million people improve their living conditions in every state in the nation and in 70 countries since it was founded in 1976. In 2018 alone, Habitat helped 8.7 million people secure new or improved housing. The group’s vision is to create a world where everyone has a place to live. The UNC Habitat chapter has built more than 40 homes in association with Orange County Habitat since 1994. In 2011, the chapter received Habitat’s Campus Chapter of the Year Award because of its ambitious Build a Block project in which students, faculty and staff came together to help University and UNC Health Care families build 10 Habitat houses. Reckford was awarded the University’s Distinguished Alumnus Award in 2012. He also was the featured speaker at the University’s 2012 Eve Marie Carson Lecture. He serves on the boards of the Federal Reserve Bank of Atlanta and the Duke Center for the Advancement of Social Entrepreneurship, and he is a member of the Council on Foreign Relations and the Urban Steering Committee for the World Economic Forum.